The intricate biomechanics occurring during running, cycling and swimming are difficult to pick out with the naked eye. Using computerized video analysis, I can slow the movement and view it from many different angles. Frame by frame analysis of arm movement, trunk rotation, hip and leg alignment, foot placement, and rearfoot motion will enable us to detect even minor deviations. Allowing you to see exactly what your body is doing will assist with understanding of and subsequent modification of your running, cycling or swimming style. Two reasons, performance and injury prevention. If you are running, cycling or swimming with less than ideal mechanics, extra energy is going to that unneeded movement. When that happens, all of your efforts are not going to the activity you want (like running) and many of your movements are “wasted.” To perform at the highest level, it is imperative that your movements are efficient and necessary. 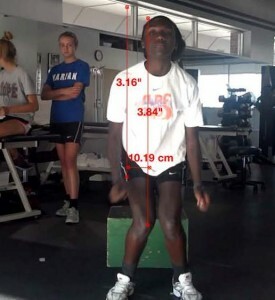 I can also identify movements that have the potential to cause injury (e.g., excessive pronation, knee valgus). so, how do i analyze your movement? I use the award winning software designed by both Kinesiocapture & Dartfish, companies that specializes in producing digital images to bridge the gap between our observation and your perception. Dartfish has been endorsed by 10 international governing bodies including those for track and field, volleyball, gymnastics, and swimming. At the 2010 Winter Olympics in Vancouver, Dartfish software was used to help train 45 Olympic medalists from the U.S. and five European countries. Dartfish was also in Beijing (2008 Summer Olympics) to prepare images for several television networks, including NBC in the US. The training-injury prevention paradox: should athletes be training smarter and harder?